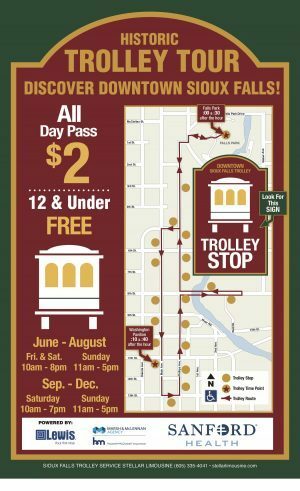 The Downtown Trolley is a hop-on, hop-off historic tour of downtown Sioux Falls and offers a unique experience for the whole family to enjoy. Riders can hop on or off at any trolley stop to take a break and enjoy all downtown has to discover! The trolley makes a loop from Falls Park in the north, down Main Avenue to the Washington Pavilion, and back up Phillips Avenue to Falls Park, stopping along the way at 8th & Railroad Center on East 8th Street. Each loop takes 25-30 minutes. Riding the trolley is just $2 a day per person, and kids 12 and under ride FREE. Trolley vehicles are also ADA accessible. Click the map for a high resolution image. The Downtown Trolley is a partnership between DTSF, the City, Stellar Limousine, and our generous sponsors. Special thanks goes to Sanford Health, Lewis Drug, Howalt+McDowell, a Marsh & McLennan Agency, Great Plains Brokerage, and Sanford Health Plan for their support.